This title includes tests of diagrammatic reasoning feature in the recruitment process for professional services, finance, accountancy, graduate traineeships, architecture, engineering and even the UKCAT. Doing well in these common assessments is largely down to practice. 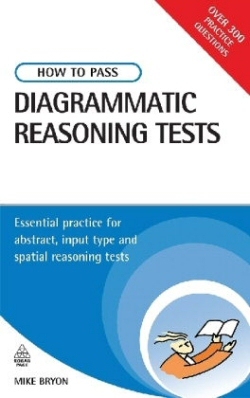 "How to Pass Diagrammatic Reasoning Tests" contains over 300 practice questions involving a series of pictorial or diagrammatic questions with little or no resort to words or numbers. Each chapter is organised into blocks of warm up questions with a mini test at the end. The questions get progressively harder. Covering abstract reasoning, input type diagrammatic reasoning and conceptual and spatial reasoning tests, "How to Pass Diagrammatic Reasoning Tests" will help you to achieve a high score and get though to the next stage of the recruitment process. Mike Bryon is an expert in psychometrics and training solutions. He is also the author of The Advanced Numeracy Test Workbook, The Graduate Psychometric Test Workbook, The Ultimate Psychometric Test Book, How to Pass Graduate Psychometric Tests , How to Pass the Civil Service Qualifying Tests and How to Pass Advanced Numeracy Tests, and co-author of How to Pass Selection Tests and How to Pass Technical Selection Tests, all published by Kogan Page.